Despite having to share the revenue with Sony and Microsoft, EA's downloadable WWII shoot has been a roaring success. 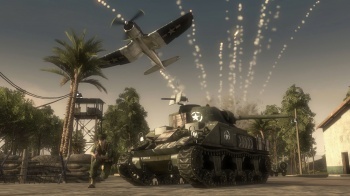 Battlefield 1943 was one of the fastest moving digital-only products that Xbox Live and PSN had ever seen, selling more than 600,000 units in its first two weeks. Unsurprisingly, this has meant some very good things for EA's bank balance, as CFO Eric Brown revealed at a conference in New York. The World War II shooter shipped with three maps - with a fourth unlocked barely a week later when players amassed a collective 43 million kills - and cost around $15 to buy on Xbox Live and PSN. Brown said that BF1943 had generated $16 million in revenue, after Sony and Microsoft had taken their respective cuts. Brown didn't go into quite as much detail about how much BF1943 had cost EA to make, but said that it was in the single-digit millions. Assuming that all the costs of getting the game to market are included in that total - which might not be the case, as Brown might be keeping other costs, like any advertising or marketing, separate - EA is looking at a profit of at least $5 - 6 million. Brown also noted the success of its other downloadable products, like FIFA's ultimate team mode, and said that he expected digital sales to account for a fifth of EA's revenue for the fiscal year. This success will surely encourage EA to make more smaller-scale, low price point games. It might even be a way for EA to test the waters on riskier IPs like a relaunch/sequel to Mirror's Edge without having to commit to a full, sixty dollar a pop, game.